Connect to your eParcel (API) and OnDemand account so ReadyToShip can print labels and send consignments. NOTE: The process below is applicable for all eParcel, OnDemand and Startrack accounts. Just enter the appropriate account number in Step 3 as shown. Step 1: If you don’t have one already, set up an eParcel account. Contact Australia Post to create an account and find out about rates. Visit the AusPost registration site and register for a new Developer Centre account. You will receive an activation email from Australia Post. Use this to activate your new account and log in. 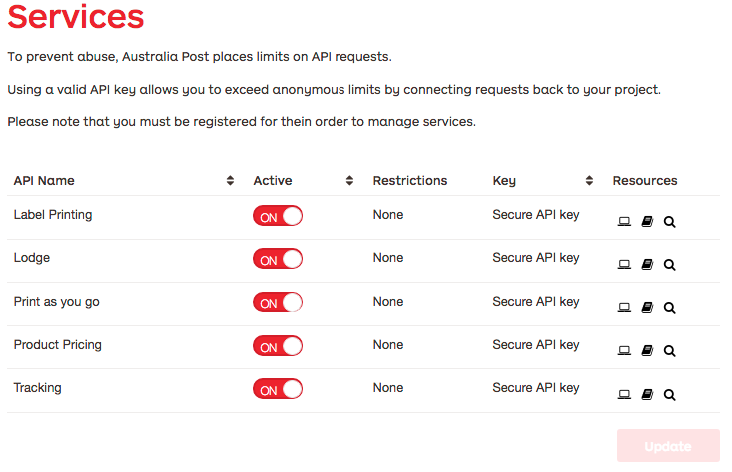 Log in to the Developer Centre with your newly created account, and navigate to the APIs page (https://developers.auspost.com.au/apis). Click on the Register your interest today link at the bottom of the 'Shipping and Tracking' section. Fill in your eParcel, OnDemand or Startrack account number and email address. Please ensure all three checkboxes are selected. 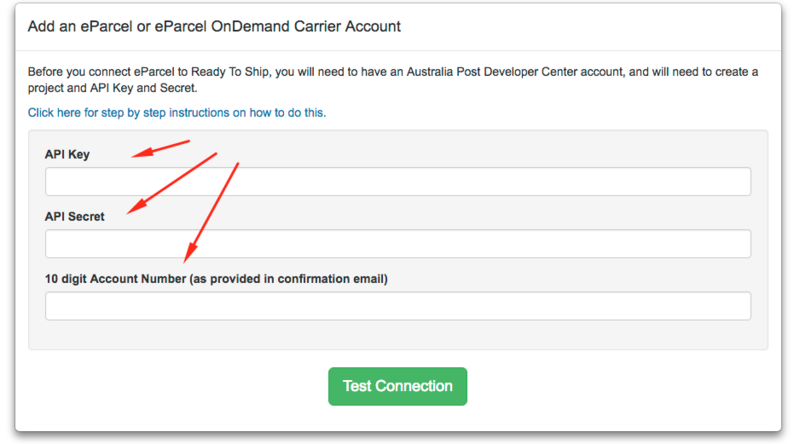 AusPost generally take about one business day to link your eParcel/OnDemand account to your newly created AusPost Developer Account. You should then receive an email from them with a PDF containing your API Key, Secret and Account number (then skip down to Step 6). If you haven't received a response from AusPost within one full business day you can send a follow up email to customer_connectivity@auspost.com.au quoting your eParcel account number and the email address you used to create the AusPost Developer Account. In your Developer Centre, click on Projects in the top menu, then click Create new project. NOTE: if Projects is not visible in the menu, then Step 3 has not been completed yet. Wait for your confirmation email from Australia Post, or get in touch with them to expedite the process. Enter a name for your project (eg. 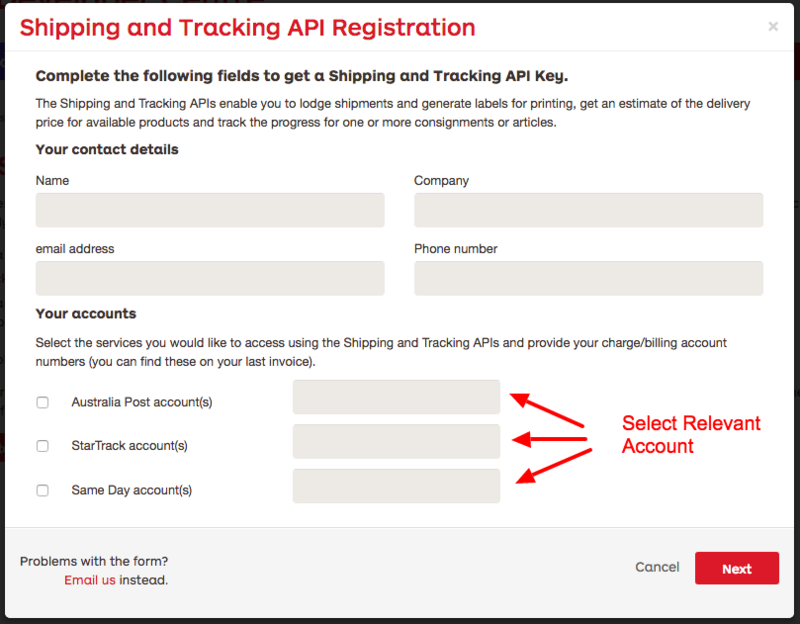 “ReadyToShip”), select your billing account and choose a API key Password (remember this, as it will be used in the ReadytoShip form in the last steps). Click View project on your new project, then in the menu on the left click Services. Turn on all the services for this project as ReadyToShip uses all of them. Click Update to save the changes. Now that you have all the information you need, log in to ReadyToShip, go to Settings ⇒ Carriers and click Add Carrier. Select eParcel from the list. Enter your API key, your password/secret and your eParcel account number, then click Test Connection. You should receive confirmation that we were able to connect to your account. If there is an error, check the steps above to make sure that you have created and entered the details correctly. If you received an error after clicking Test Connection, double check the API key and Secret (it is best to copy and paste these, not type them manually) and ensure there is no space at the beginning or end of each field.